I know many of you are in the throes of planning Christmas dinner and probably wishing for an easy, elegant alternative to roast beef or turkey. Don’t get me wrong I love a good roast with all the trimmings but it is a lot of work and for those in America we just did that three weeks ago for Thanksgiving! So my choice for an easy, elegant Christmas dinner is Scallop Bisque with a soupe de poisson base. Richer than a chowder with more body than a broth and a little bit retro. In fact it was my mother’s recipe from 30 years ago which she used to make with Nantucket Bay Scallops when she lived on Cape Cod. It is just as good with traditional sea scallops cut in half. The original recipe was made like a chowder with a milk and cream base. Adrienne and I thought it was a bit too heavy on the dairy and needed a more interesting base to set off the sweetness of the scallops. So we reduced the amount of cream and milk and added a cup of soupe de poisson. 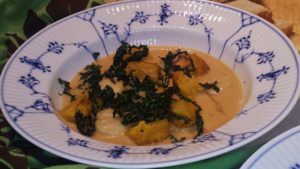 The recipe for soupe de poisson is below if you want to make it yourself, but you can also get good soupe de poisson at most fish shops or online. bit more festive. The squash, cooked in walnut oil with a little cumin, can be made in advance and kept warm. It adds a lovely balance to the taste of the soupe de poisson. The kale was a recent addition and works surprisingly well, it also adds that bit of color. If you don’t love kale you could substitute swiss chard or even radicchio, not too much though or their bitterness will overwhelm the dish. If you opt to go for the traditional Christmas dinner anyway you could always give this a try for an easy, elegant New Year’s Eve dinner! A delicious bisque with a Provençal kick from the soupe de poisson base. Add the squash and kale and you have an easy, elegant Christmas dinner. Step 3 Quarter a buttercup squash and toss with hazelnut or walnut oil and cumin, salt and pepper. Set on a baking sheet and cook for 30 minutes until tender. Cut skin away from flesh and keep warm. Step 5 Melt butter in a medium saute pan over moderate heat. When butter is foaming add shallots and cook until translucent – 1 to 2 minutes. Raise the heat and add scallops and thyme – cook about 2 minutes each side, just until the scallops color on the outside. They will continue cooking after they are removed from the heat. Keep warm on a side dish. Step 6 Deglaze the pan with white wine and bring to a boil. Add milk, cream, soupe de poisson, salt and pepper. Reduce until the mixture coats a spoon lightly – about 10-15 minutes, Beat in the beurre manié and simmer for an additional 10 minutes until sauce has thickened. Adjust seasoning, adding more soupe de poisson, salt, pepper or perhaps lemon juice remembering not to overwhelm the taste the scallops will add to the mixture. Step 8 Chiffonade the kale after removing the center rib (roll up each leaf and chop or slice into ribbons). Heat a cast iron or heavy bottomed pan until very hot. Add a tablespoon olive oil, the kale and a pinch of salt, cook until crisped, about 3-5 minutes. Step 10 Cube the roasted squash and place in warmed bowls with scallops. 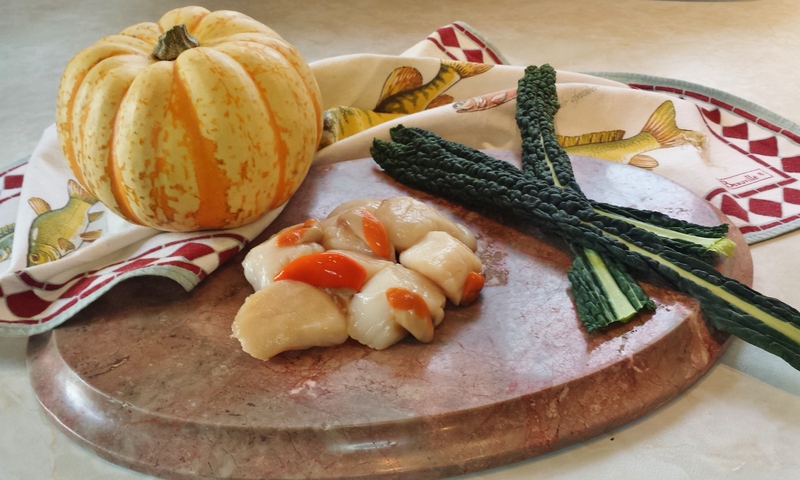 Reheat the bisque and pour over the scallops and squash, scatter the kale on top and serve. Turn fish stock into a delicious Provençal soup in which you can poach any firm fleshed fish and serve with rouille or use as a base for the Scallop Bisque. Step 1 Saute the leeks, onions, garlic, saffron, fennel seeds and red pepper flakes in 1/4 cup olive oil till softened – 5 to 10 minutes. Add the tomato paste, tomatoes and fish stock. Simmer for 20 minutes. Taste for seasoning – add salt and pepper. Strain, reserving liquid, pressing hard to extract all the liquid. Cool and refrigerate or freeze. Hello, This is a lovely quick recipe, thank you for taking the time to write the article for the awesome post. I am a food lover and I like baking milk tart.